i know some folks on here arnt to sure about the wheelbacks, but i seem to love them! I was able to use a Singer wheelback from a friend, to hem some jeans, and it was super simple to use. If youre going vintage, wheelbacks are the way to do it! Here it is at his place. so heavy! I know what youre thinking Ken! theyre not as tough and difficult to handle as many led you to believe. Its like a pet grizzly bear. Sure its a grizzly bear, and it can tear your arm off. But its been trained and domesticated, just treat it with respect and it wont rip off your face and chew on it till it looks like used gum. Remember Jonah? (EXTREMESEWER44, he had like a thousand posts back int he day), from the forum a while back, lost four of his fingers mishandling a wheelback. And that was on the hand he only had four fingers on in the first place! Jonah is doing fine, ofcourse he doesnt go on the forum anymore, since the accident. Yeah, Jonah was the first person to come to mind when I saw that wheelback. That was an ugly episode, but proves what power lies behind an old wheelback Anybody spoken to him lately? I sure wish he would join us again. Rambam wrote: Yeah, Jonah was the first person to come to mind when I saw that wheelback. That was an ugly episode, but proves what power lies behind an old wheelback Anybody spoken to him lately? I sure wish he would join us again. I still hear from him now and then. He really hasn't been the same since the incident. Pretty sad really. He won't go near a wheelback now, but it's kind of hard to blame him. Looks nice but I saw a thread over on the Sewer's Blog about big shipments of counterfeit Singer wheelbacks coming out of Paraguay and Argentina! 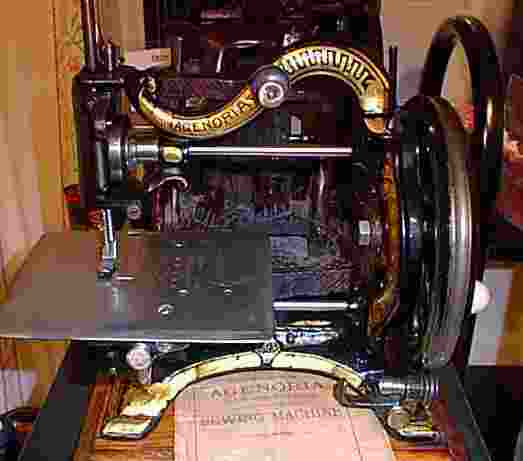 We all know how South America and especially the Patagonia region is a hotbed for counterfeit or franken-vintage sewing machinery ; in fact, I heard that the President is considering commissioning a board to review the problem. This could be very big stuff. I heard the name "Jason Recliner" bandied about here in DC recently as the potential head of this board. Vintage market prices will only go higher on this news!!! You know the saying ... "Once bitten, twice shy". A senseless tragedy really. That is quite a piece Dom. I have no words to describe what I'm feeling right now. Your friend is the luckiest guy in the world IMO. Tell him from me-Use it in good health. Tell him to be careful handling that thing.. they sure don't make 'em like that anymore. And it really is too bad about Jonah. I don't think anyone hears from him much anymore. Since the accident I understand it's pretty hard for him to dial the phone now. Really is a shame. I've been into wheelbacks for years!! My friend had a really special wheelback machine. It was usually inoperable for one reason or another so we nicknamed it 'brokeback'..
Too bad, though, because it was really sweet. Nice pickup, Dom. Vintage isn't really my type - I like the modern marvels. But that looks like a stellar find. Ummmm, the brass plating in picture #2 doesn't look right to me. Am I wrong, or does she have her left leg pulled behind her??? Also, that plate is way too shiny.